Latex paint is a popular, affordable and durable choice for a variety of home-improvement projects. A mixture of synthetic resins, solvents and coloring dissolved in water, latex paint does not contain any actual latex as we know it. Mention latex and most minds turn to the surgical gloves and latex allergies. Latex paint, however, does not cause latex allergies because it doesn't contain natural rubber--the type of latex found in medical gloves and other natural latex items. Over 1 billion gallons of paint and similar coatings are consumed in the U.S. each year. Which poses the question--what do you do latex paint when you are done with it? 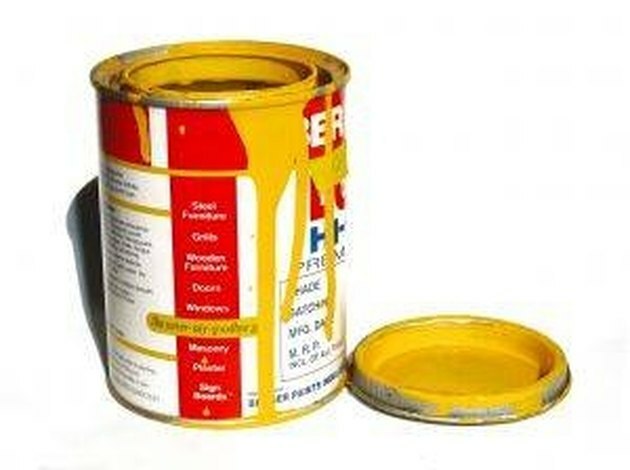 As of 1992, latex paint can not contain mercury; therefore, it is not considered a hazardous material. Yet even though latex paint is not considered hazardous, it cannot be disposed of in liquid form, as it could make a mess. Latex paint can be recycled or collected through your local household-waste program, but it must be prepared accordingly before pickup. According to the National Paint & Coatings Association, latex paint is "the largest volume waste collected by metropolitan household waste programs." Add one part cat litter, sand or sawdust, or paint-drying crystals to one part leftover latex paint. Allow the paint and absorbent material to sit uncovered until the mixture has fully hardened. If your paint container is less than 1/4 full, you may be able to leave the lid off and allow the paint to air-dry in the container without adding absorbent materials. Place the paint, with the lid off, in the regular trash. Consider recycling the paint if you are unable to follow Steps 1 to 3. Contact your local hazardous-materials program or recycling center to find a place near you that accepts latex paint. Jessica Pestka has been a nonfiction writer for almost a decade. She uses her education and work in optics and pharmaceuticals often in her writing. Pestka obtained her Bachelor of Science degrees in biology and English from the University of Wisconsin, is certified as an optician by the American Board of Opticianry and attended acupuncture school at the Midwest College of Oriental Medicine.